"I bought Mark Harmon's Excel Master Series manual as a reference for a graduate course on statistics that I was taking as part of an MBA program at the University of Delaware. I purchased the materials about halfway through the course and wish I had known about this manual from the start of the class! Mark has done a great job in writing complex statistical concepts in an easy to understand format that makes grasping them both easy to understand and to use. With the help of Mark's book, and some diligent studying, I received an A in my stats course. Thanks Mark! " In additional to the Normal, t, and Binomial distributions, there are a number of other useful distributions that are commonly used to solve statistical problems that occur in business. Exponential Distribution Problem 1 - Calculate the probability of an exponentially-distributed event (a defect in a production line) occurring within a certain time. The Multinomial Distribution is a generalization of the well-known Binomial Distribution. Like the Binomial Distribution, the Multinomial Distribution is a Discrete distribution, not a Continuous distribution. This means that the objects that form the distribution are whole, individual objects. This distribution curve is not smooth but moves abruptly from one level to the next in increments of whole units. The Multinomial Distribution provides the probability of a combination of specified outputs for a given number of trials that are totally independent. The probability of each of the individual outputs of each of the trials must be known in order to utilize the Multinomial Distribution to calculate the probability of that unique combination of outputs occurring in the given trials. The following example makes the Multinomial Distribution easier to understand. Problem: A box contains 5 red marbles, 4 white marbles, and 3 blue marbles. A marble is selected at random, its color noted, and then the marble is replaced. 6 marbles are selected in this manner. Find the probability that out of those 6 marbles, 3 are red, 2 are white, and 1 is blue. There is a 12.06% chance that, from a box containing 5 red marbles, 4 white marbles, and 3 blue marbles, from 6 marbles randomly selected, 3 are red, 2 are white, and 1 is blue. This same problem above is solved in the Excel Statistical Master with only 1 Excel formula. Everything is explained to you in SIMPLE language in the Excel Statistical Master. When k = 2, the Multinomial Distribution is the Binomial Distribution. The Hypergeometric Distribution is almost the same as the Binomial Distribution, except that samples are NOT replaced back into the population. This is known as Sampling Without Replacement. The Binomial Distribution calculates the probability of 1 of 2 possible outcomes occurring a certain number of times (x) in a certain number of independent trials (n). The probability of the outcome occurring in a single trial is known (p). After each trial the samples ARE replaced back into the population when using the Binomial Distribution. The Hypergeometric Distribution calculates the probability of 1 of 2 possible outcomes occurring a certain number of times (x) in a certain number of independent trials (n). The probability of the outcome occurring in a single trial is known (p). After each trial the samples are NOT replaced back into the population when using the Hypergeometric Distribution. There is a 13.87% probability that 3 out of 4 samples taken without replacement will be caramel samples if the box initially had 20 pieces of candy that included 8 caramel samples. The y-value corresponding to the point on the horizontal axis equaling 8 is 13.87%. This same problem above is solved in the Excel Statistical Master with only 1 Excel formula. The Excel Statistical Master is the fastest way for you to climb the business statistics learning curve. This problem is solved using the Probability Density Function and not the Cumulative Distribution Function because we are solving for exactly 3 caramels chosen in 4 trials, not up to 3 caramels. There is 15.36% chance of exactly 3 successes in 4 trials given Sampling with Replacement and the Probability of Success on each trial is 0.40. Note that the graph at point 3 on the Horizontal has a y value (probability) = 0.1536. This same problem above is solved in the Excel Statistical Master with only 1 Excel formula. The Excel Statistical Master teaches you everything in step-by-step frameworks. You'll never have to memorize any complicated statisical theory. The Poisson Distribution is a Discrete distribution. This means that the events described by this function occur in whole units. The graph of the Poisson Distribution therefore moves from one level to the next in discrete increments, not smoothly. The Poisson Distribution is used to calculate the probability of a certain number of specific events occurring over a given period of time - if it is known in advance that those events occur in frequency as predicted by the Poisson Distribution. Previous measurement must have been taken to determine: 1) that the events occur in frequency according to the Poisson Distribution, and 2) the average rate, which is the expected number of occurrences of that event over the given time period. Cumulative Distribution Function? No, Use the Probability Density Function. would measure the probability of up to 4 phone calls instead of exactly 4. There is an 18.2% chance of exactly 4 phone calls per minute. a value of 0.182 on the vertical axis. The Poisson distribution is a discrete distribution and not a continuous distribution so the graph has corners at each point instead of being smooth. There is a 47.6% chance of up to 4 phone calls per minute. Note that the point that represents up to 4 calls per minute corresponds with 0.47 on the vertical axis. This same Poisson problems as above are each solved in the Excel Statistical Master with only 1 Excel formula. With the Excel Statistical Master you'll never have to look up anything on a chart ever again. A variable is uniformly distributed if all possible outcomes of that variable have an equal probability of occurring. For example, if a fair die has 6 possible outcomes when rolled once, each outcome has the same 1/6 chance of occurring. The Uniform Distribution is a Discrete distribution. This means that its events described by this function occur in whole units. Problem: A fair die is rolled once. What is the probability that either a 2 or a 5 will appear on top after the roll? There is a 33.33% probability that either a 2 or a 5 will appear on top after the roll. curve would not be a smooth exponential curve as described by the Exponential Distribution. k is sometimes called Lambda. Calculate the probability of a defect being produced within the next 1/10th year. Note that the graph point at Time t = 0.1 has the probability of 0.5934.
between Poisson-distributed events. Examples of these would include queuing models, the flow of items through manufacturing and distribution processes, and the load on web servers and many forms of telecom. Due to its moderately skewed profile, it can be used as a model in a range of disciplines, including climatology where it is a working model for rainfall, and financial services where it has been used for modeling insurance claims and the size of loan defaults. It has therefore been used in probability of ruin and value-at-risk equations. Problem: Calculate the probability of the a Poisson-distributed event occurring before Time t = 10 if the Gamma Distribution function has alpha, α, = 2 and theta, Φ, = 4. Note that the graph point at Time t = 10 has a probability of 0.7127. This same problem above is solved in the Excel Statistical Master with only 1 Excel formula. 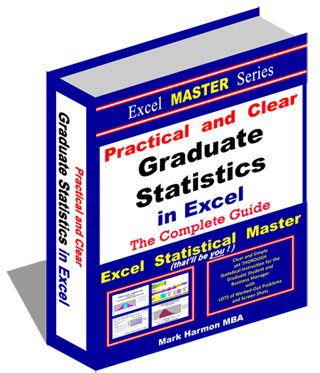 The Excel Statistical Master will make you a fully functional statistician at your workplace. The Chi-Squared Distribution is a Gamma distribution in which the shape parameter, α, is set to the degrees of freedom divided by 2 and the scale parameter, Φ, is set to 2. The Gamma Distribution with its shape parameter, α, set to 1 and its scale parameter, Φ, set to b, becomes the Exponential Distribution with k, lambda, set to b. Note that the graph point at Time t = 5 has a probability of 0.908. This same problem above is solved in the Excel Statistical Master with only 1 Excel formula. With the Excel Statistical Master you can do advanced business statistics without having to buy and learn expensive, complicated statistical software packages such as SyStat, MiniTab, SPSS, or SAS. expanded and include Finance and Climatology. There are three parameters of the Weibull distribution: time t, α - alpha (the shape parameter), and ß (the scale parameter). Problem: Calculate the probability that a part will fail at time = 2 if the part's failure occurrence is Weibull-distributed and has a = 0.5 and ß = 4. We are determining the probability of part failure at exactly time t = 2 so we are using the Probability Density Function. The probability of part failure occurring at exactly Time t = 2 ("exactly at" indicates using the Probability Density Function) given that time to part failure is Weibull-distributed with a = 0.5 and ß = 4 is calculated is 8.7%. Note that the graph point at Time t = 2.0 has a probability of 0.087. Problem: Calculate the probability the a part will fail by time = 2 if the part's failure occurrence is Weibull-distributed and has a = 0.5 and ß = 4. We are determining the probability of part failure by time t = 2 so we are using the Cumulative Distribution Function. The probability of part failure occurring at exactly Time t = 2 given that time to part failure is Weibull-distributed with α = 0.5 and ß = 4 is 50.6%. This same Weibull Distribution problems as above are each solved in the Excel Statistical Master with only 1 Excel formula. You'll finally have a solid understanding of business statistics with the Excel Statistical Master. The F Distribution is used to determine whether two groups have different variances. The F Distribution is normally used to develop confidence intervals and hypothesis tests. It is rarely used for modeling applications. found in the course module entitled "Chi-Square Independence Test." The F Distribution is actually a family of distributions. Each different F Distribution has a unique combination of ѵ1 and ѵ2. to the right of the F Statistic). The p Value is compared with a, the required Level of Significance. If the p Value is less than α, then the two data groups are assumed to have different variances. If the p Value is greater than α, the two data groups are assumed to have equal variances. ANOVA testing is used to judge whether three or more groups have the same mean (for example, same test scores) after each group has had a different treatment applied to it (for example, a different teaching method applied to each group). If there no real differences between the groups being tested, one would expect that any measured differences between the groups would not be much different than measured differences between samples taken from within individual groups. A F Ratio ( sometimes called an F Statistic) compares the differences between groups to the differences within groups. The larger the value of the F Ratio (sometimes called the F Statistic), the greater the likelihood that the difference between groups is due to Real Differences and not just due to chance (Random Differences). The required degree of certainty (for example, we want to be at least 95% that the groups are different) determines how large the F Ratio has to be for us to be able to state that the groups are different. The F Statistic and F Critical are calculated using the same ѵ1 and ѵ2. If the F Statistic is greater than the F Critical that is calculated for a specific degree of certainty, we can state that groups are statistically different. methods are assumed to not be independent of each other because different closing methods are shown to produce different sales results. The problem requires determination of whether closing methods used have an affect on sales. Three sales groups were each required to use a different closing method for the entire test. The total sales results from each group were recorded. ANOVA analysis was employed to determine with a 95% Level of Certainty whether the choice of closing method affected the level of sales. data is labeled the "Within Groups" data. An F Statistic was calculated based upon these two groups of data. The calculated F Statistic was found to be greater than the F Critical Value that was based upon the 95% Level of Certainty. Therefore this implies that sales are not independent of closing method used. See the ANOVA module for the complete calculation. The calculated F Statistic(ѵ1 = 2, ѵ2 = 9) = 7.04. This is greater than F Criticalα=0.05 (ѵ1 = 2, ѵ2 = 9) = 4.265. This indicates that there is less than a 5% chance that this result could have occurred if there was no difference in the effectiveness between the closing methods. Therefore, there is at least a 95% certainty that there is a real difference in effectiveness of the closing methods. The Null Hypothesis, which was therefore rejected, states that choice of closing methods does not affect sales. 0.0144 is less than a (0.05) so it is assumed that the two groups are not independent. Sales are therefore related to the closing method used because the variances are different.